Newburyport coach Lori Solazzo sends Molly Stanton home in the seventh inning. Vicki Allman struck out nine batter and issued no walks. 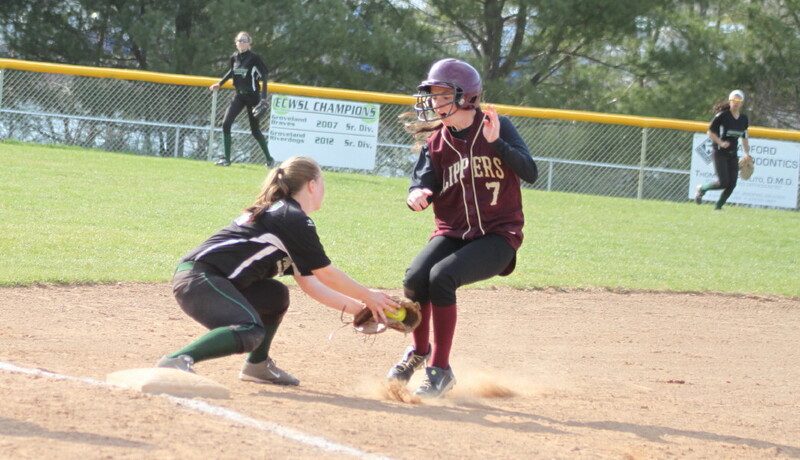 (Groveland) Newburyport snapped a two-game losing streak by defeating Pentucket, 6-2, on Friday afternoon at the Pines Athletic Field in Cape Ann League softball. The Clippers (3-4) were flawless in the field. It certainly helped that there were only three infield chances on the ground in the entire game. Vicki Allman tossed a six-hitter with nine strikeouts for NHS. She was able to get six fly-ball outs – five of them to centerfielder Lea Tomasz. She allowed no walks. It took a hit for the Sachems to get on base in this one. 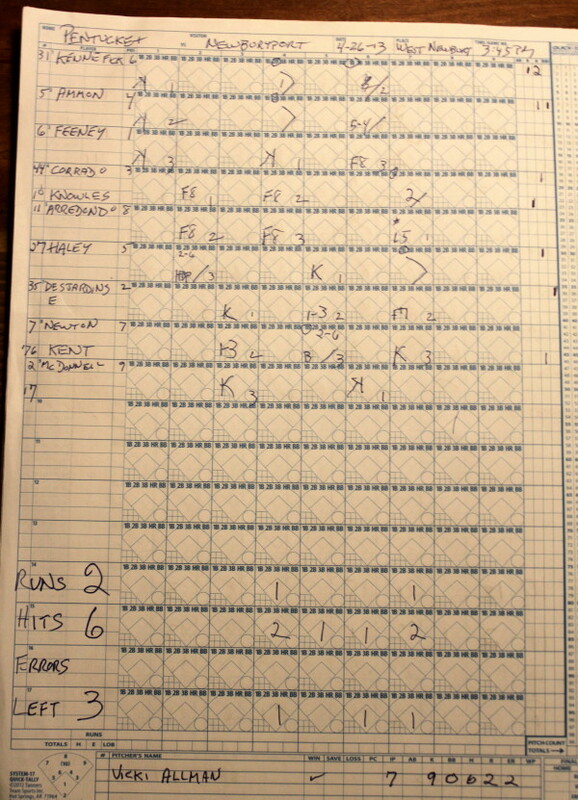 Pentucket (1-7) had five errors and four unearned runs resulted, according to my unofficial count. Miscues by third baseman Megan Haley and leftfielder Madison Newton enabled Lauren Singer and Meghan Stanton to register two runs in the second inning. 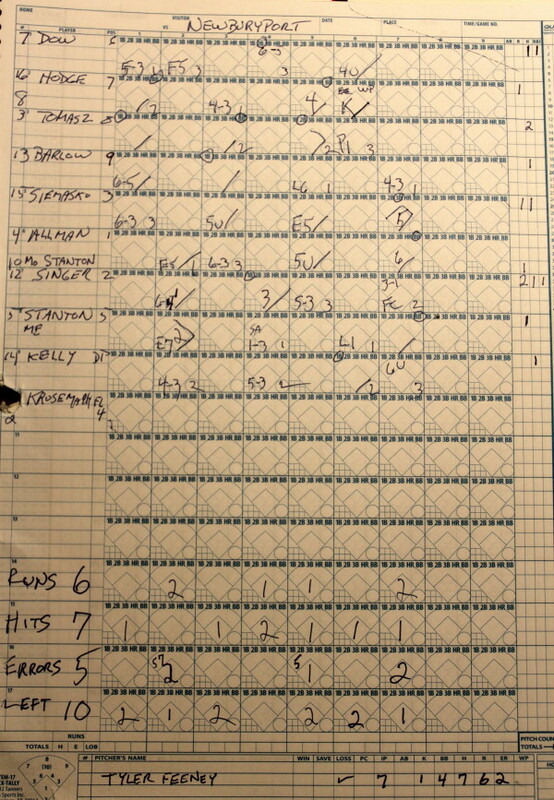 Meanwhile, Vicki Allman faced only nine batters during the first three innings. Megan Haley did reach on a hits batsman in the second but was gunned down trying to steal on a throw from catcher Lauren Singer to shortstop Kendra Dow. 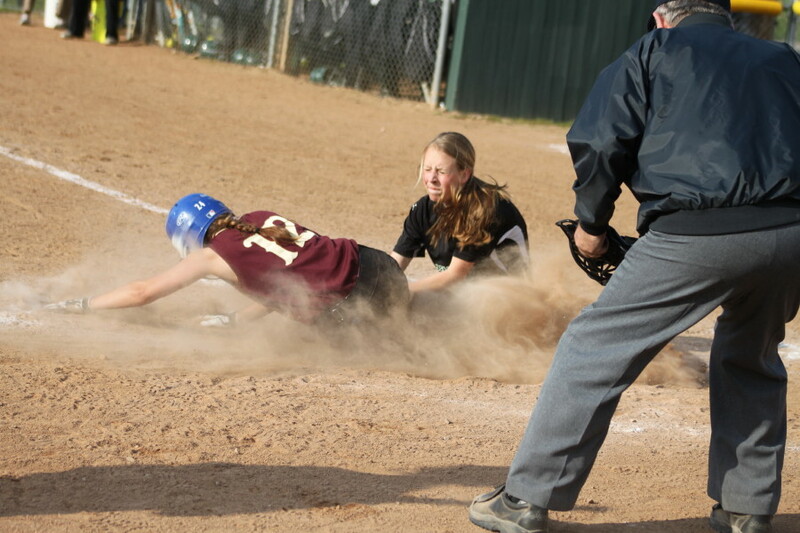 Megan Haley tags out Kendra Dow at third. The Clippers picked up their third run in the fourth. Lauren Singer singled and scored on Kendra Dow’s double. Kendra was thrown out at third, trying to stretch that double, ending the inning, but NHS led, 3-0. 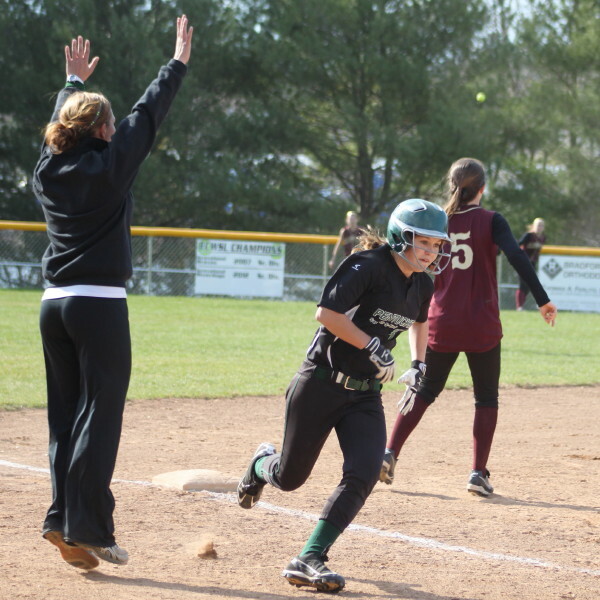 Pentucket broke through with a run in the fourth on consecutive doubles by sophomores Kassidy Kennefick and Maddy Ammon to lead off the inning. Consecutive fly outs to centerfielder Lea Tomasz ended the inning. In the fifth, Newburyport added a run to their lead. A walk (Ashley Hodge), a double (Lea Tomasz), and an error on a hot shot by Carley Siemasko at Megan Haley at 3B produced the run. The Clippers put up two more runs in the seventh to pad their advantage to, 6-1. A triple (Carley Siemasko) and a walk (Vicki Allman) set the stage with one out. Molly Stanton pinch ran for Vicki. 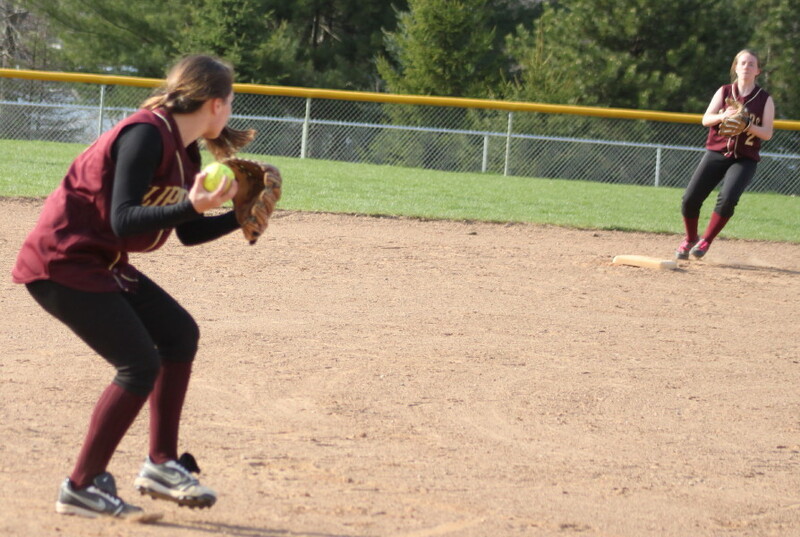 As Molly broke for second (trying to steal) the batter (Lauren Singer) hit an infield grounder. Because Molly was running the throw to second was not in time. The play wasn’t over. Two errant Pentucket throws in a row (one to home) enabled two Clippers to score. 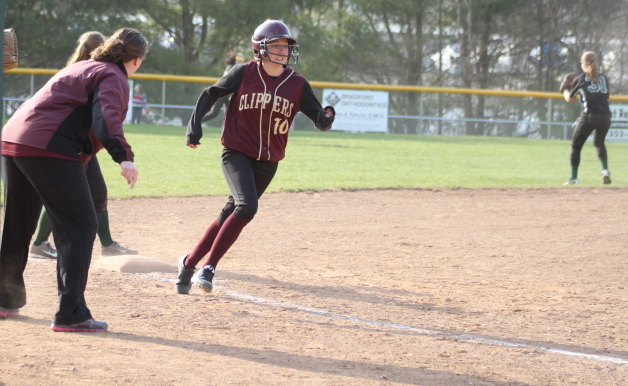 Kassidy Kennefick heads for home in the seventh inning. That five-run cushion came in handy for Newburyport in the seventh. Mary Kate Corrado singled (Allison Knowles ran for her) with no outs. Angelica Arredondo followed with an absolute screamer at NHS third baseman Meghan Stanton that the sophomore caught. That grab was crucial because next batter Megan Haley whacked a double to deep center. So instead of three straight hits the Sachems had runners on second and third. Emmy Desjardins drove in Allison Knowles with a fly ball to left before Nicolette Kent was called out on strikes to end the game. 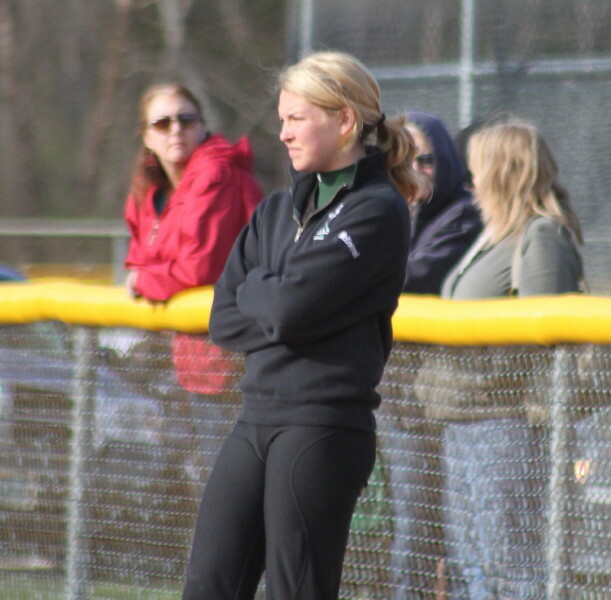 Pentucket played without 2012 Cape Ann League All Star Sydney Snow (sore elbow). 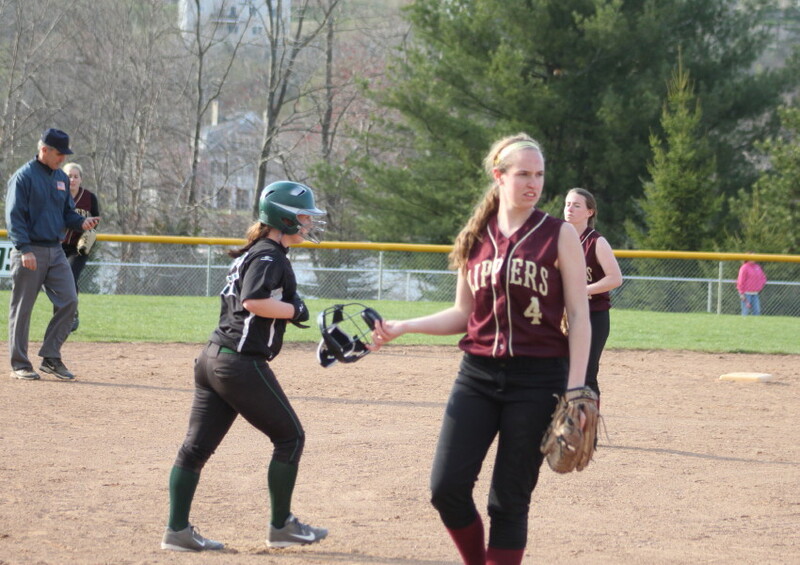 NHS catcher Lauren Singer threw out two runners attempting to steal. She also scored two runs and had a hit and an RBI. Sophomore Kassidy Kennefick made several nice plays at short. She also had two hits and scored a run. Lauren Singer is tagged out at home by pitcher Tyler Feeney. Tyler Feeney went the distance for the Sachems. She allowed seven hits and gave up four walks. The defense behind her? You already know about that! This was my first look at Molly Kelly (up for the JV’s) for Newburyport. Molly had a single in the sixth inning. Graduated Maddy Stanton was on hand to take this one in. I had never been to this field before. I realized once I found it that it was the site of the old Pine Speedway. I spent quite a few college years’ Saturdays watching the races. The track closed in 1972. Next game for both teams is on Monday. Newburyport will be at Manchester-Essex while Pentucket visits Lynnfield. Mary Kate Corrado batted .456 last season. No wonder she made the CAL All-League team. 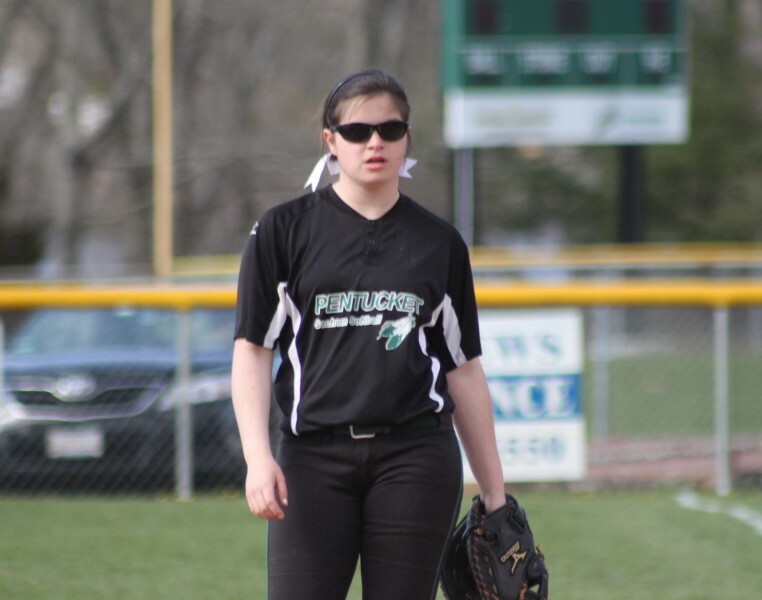 Pentucket played four games this week. In one of them, they knocked off previously undefeated (in the CAL) North Reading. Vicki Allman gets rid of her mask after striking out the last batter of the game.